How often do you change to a new phone? And what do you do with your electronics when they stop functioning? Contacts For Potential Clients is a project concerning today’s view on material value. 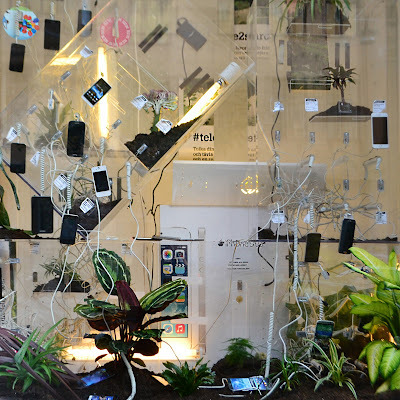 The installation is site specific, based on recycled plexi-showcases from the phone company Tele2. The material was thrown out on the street early 2015 during a renovation of the Tele2 store at Götgatan, Stockholm. One could find everything from televisions, Ipads and expensive interiors, some were fully functioning and others were clearly broken by careless handling during the removal. It all came along with commercial posters of their offers, intertwined with pictures of nature. The installation is presented Friday May 22 at 18 PM and will be running in 2 months. Isabelle Lind Färnstrand is a student at KKH / Royal Institute of Art in Stockholm. She works with three-dimensional installations and sculptures that extends and comments on the surrounding atmosphere and contexts. Her works are material-based in a way where she works against the material to challenge its meaning and nature. She uses it as a mean to amplify what we have around us that is hard to grasp or that we take for granted.